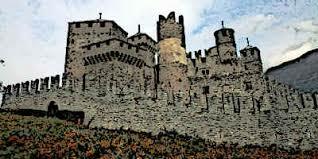 Today we would like to start putting emphasis on the series of lost castles in the region of Locarnese (see our previous post on Magadino): the Castle of Gordola. As a matter of fact, little is known about this lost castle of Gordola. It was probably built around 1100 by the Vescovy of Como and assigned to the Locarnese family of the Orelli, which was a lineage belonging to the noble families Capitanei of Locarno. The picture used in our blog provides merely an idea to the reader of how the castle could have looked like today. The castle was erected in Gordola in the area that is called nowadays Rongia. It is most likely that back in the time, the cast was close to the shores of Lago Maggiore. It is also possible that this castle protected the right bank of the Ticino river. Unfortunately, it was destroyed very early, around 1380, during the Guelfs and Ghibellines wars (Kientz 1942). According to the historian Virgilio Gilardoni, there are yet no particular studies on the layout of this long gone castle. Ferdinando Kientz, Studio sulle pergamene e i documenti del patriziato di Gordola, Bollettino Storico della Svizzera italiana, 1942, p. 18-47. The article of Kientz is also accessible through the Archivio digitale dei quotidiani e dei periodici.